“It’s fair to say, when I receive enquiries to my inbox about photographing weddings at Bruisyard Hall, I inadvertently squeal with excitement! Why’s that? Because Bruisyard Hall, in lovely Saxmundham, is a wedding venue that never fails to disappoint. The first thing that strikes you on approach to the venue is their long driveway surrounded by far-reaching views, and this leads up to the main house, which is where both the ladies and gents can get ready before weddings. Not only is this nice and convenient for us to photograph both tribes getting ready, it’s a really lovely place to get ready, with tons of natural light and contemporary space. For photos, natural light is your best friend! 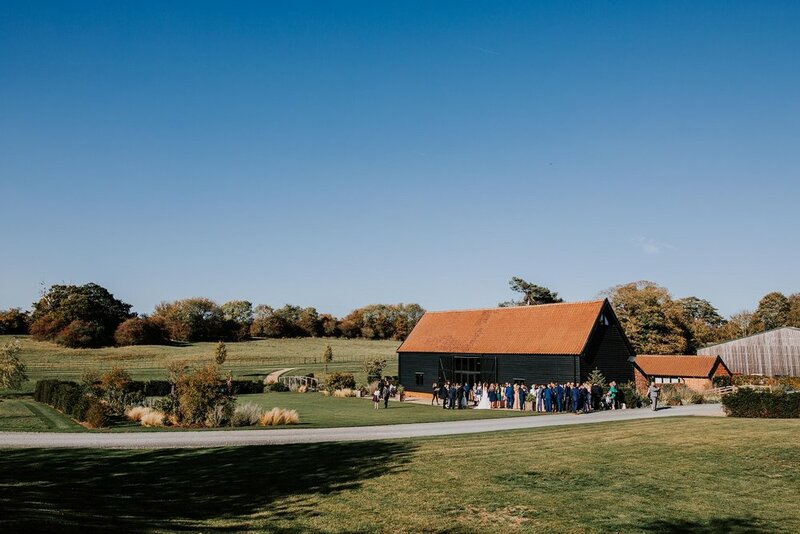 If couples are having civil ceremonies then they’re held in Bruisyard’s barn, a short walk from the main house, and this is a sweet, intimate space for couples to exchange vows. When me and my second shooter photograph, I stay discreetly at the top of the altar and my colleague is tucked away at the back by the entrance, providing two perspectives of the ceremony. Once the formalities are over, whilst guests mingle on one of their terraces, I like to really make use of Bruisyard’s beautiful grounds. Frequently we’ll head back up to the main house and use it in a variety of ways, whether as a grand backdrop in the distance, or up close using it’s lovely red brick and rustic doors and windows, or indeed around behind it on some steps. As we head back towards the barn, I always like to snap the couple walking casually back away from the house, as it always looks great in the background. Because that’s one of the major reasons people love Bruisyard, hey? There’s a little bridge surrounded by vibrant flowers which adjoins the driveway and access to the barn. This often provides a great opportunity for photographs, whether the couple are on the bridge or beside it, as the colours from the flowers bloom for many months of the year. And I’ve found as the sun sets in the evening for golden hour, the soft evening light looks dreamy on the bridge! The guys who run Bruisyard Hall know exactly what they’re doing, and I really enjoy working alongside them, as they also are mindful of what wedding suppliers such as myself are doing, and what we need to ensure the couple’s wedding day runs smoothly. It’s really important to work well in conjunction with wedding venue staff, as we’re all striving to provide a great experience for the wedding couple. As we’re both on the same wavelength, chances are it’s going to be a wicked day for everyone!”.